Anyone who’s walked down Sheridan Boulevard knows it’s a dangerous street where dirt mounds replace sidewalks, drivers ignore the 35 mph speed limit, and crossing the street means dodging five lanes of traffic. 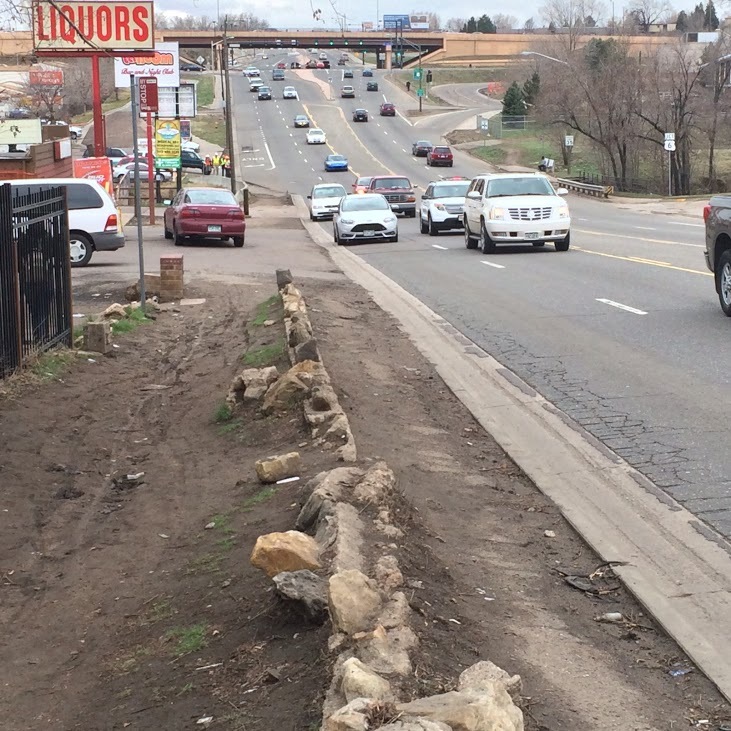 It’s a nightmare for pedestrians and the Colorado Department of Transportation knows it. But that’s not stopping them from widening lanes nearby. Between 2010 and 2013, 14 crashes involving pedestrians occurred in the one-mile area of Sheridan between 6th and 17th Avenues, according to the Denver Regional Council of Governments. Two pedestrians were killed, one was permanently disabled, and seven were injured. It’s safe to say that Sheridan Boulevard needs some work — a lot of it — to become walkable. Planners, engineers, police officers, and livable street advocates walked the Sheridan strip in March and recorded their observations as part of a “challenge” from DOT Secretary Anthony Foxx to make the country’s streets friendlier for pedestrians. The assessment [PDF], finalized last week, tells us what we already know: Sheridan Boulevard is deadly for pedestrians. According to the report, most people who live in the study area are low-income residents who depend on transit. And despite the corridor being one of RTD’s busiest for bus and rail service, the lack of sidewalks, safe bus stops, and intersection safeguards makes it unsafe to use public transportation. In fact the two-year-old Sheridan Station is zoned for transit-oriented development but so far only boasts a gas station and a parking lot nearby. Those are the problems. Some solutions will hopefully come in part from the $1.6 million in state funding Denver and Lakewood just received to improve the area for pedestrians. But while that may represent one step forward, current projects on Sheridan are taking Denver two steps back. One federally funded CDOT project will widen Sheridan Boulevard’s five lanes and another will add a sixth (a right turn lane), according to the report. The assessment, while a nice gesture, is just that. It has some helpful information but no teeth. Instead of affecting policy, it makes vague recommendations. Instead of a conclusion the document has “closing thoughts.” There are no concrete next steps, nor any plans for another boots-0n-the-ground assessment on any other corridor. It checks a box so the city can say it participated in a federal initiative, but offers no long-term change. A real commitment from the mayor would not just assess the streets like Sheridan, it would fix them. The city has several complete streets plans already and is full of advocates, planners, and engineers who know what needs to be done. Now Hancock needs to direct his public works department to carry them out and ensure they have funding in the budget he controls. The city could also use a pledge to avoid widening streets. Denver doesn’t need an “action team.” It needs action. Without sidewalks, you’ll never get transit-oriented development. The city should simply build the sidewalks.